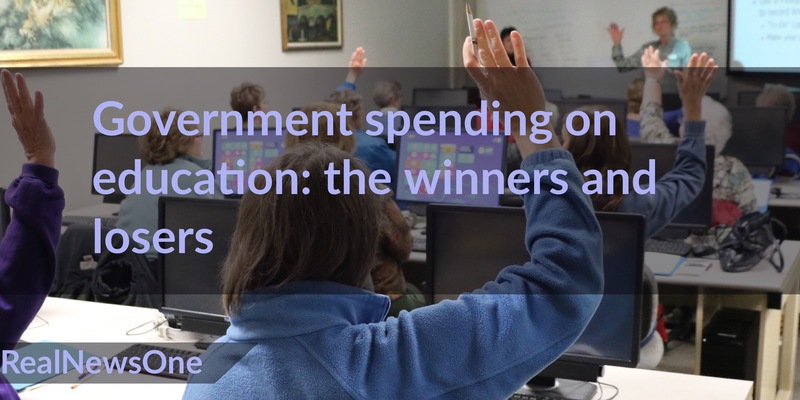 When it comes to government spending, all parts of education are not treated equally, new research shows. Over the last decade, spending on Vocational Education and Training (VET) has plummeted 4% below 2005 levels, while higher education expenditure soared by 45% in ten years. In schools, spending grew by over 23% in ten years and preschool expenditure increased 125% starting from a much lower base in 2005. Change in education expenditure (real terms) over the last ten years. While all education stages may not need the same amount of money, they should still receive equal attention when reforms are being considered. This is to make sure money is allocated where it will have the greatest impact. By global standards, Australia’s education system provides some significant causes for celebration. We have almost all four year olds enrolled in preschool. We achieve above OECD average scores on international school tests. And some of our universities and training centres are among the best in the world. But if you remove global comparisons and look closely at our own performance over time, it begs a question around whether money is hitting the right targets. There is a significant imbalance in expenditure on tertiary education, our performance in literacy and numeracy has slipped, and disadvantaged children in particular are still missing out on the right amount of early education to prepare them for school. VET expenditure trends tell a worrying story about quality vocational education not being a priority for governments. The latest 2014-15 data saw VET spending drop to almost 4% below 2005 levels. 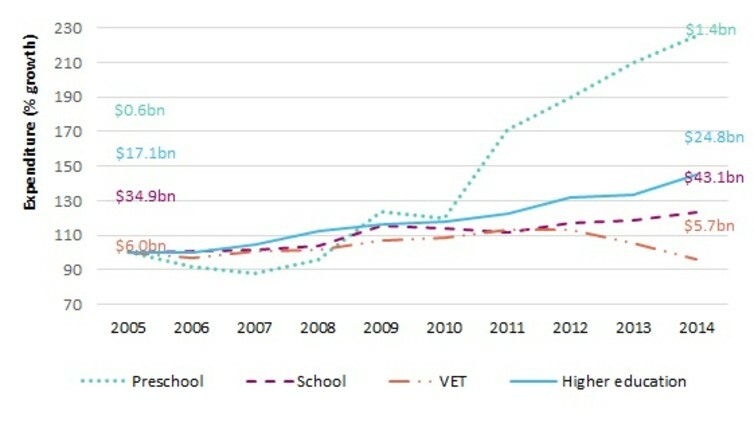 VET enrolments have taken the sharpest dive over the ten year period of more than 10%. Changes in enrolments across education sectors. Spending and enrolment patterns can’t be ignored. The VET FEE-HELP scheme has been misused by some providers inappropriately enrolling students and charging excessive course fees. This behaviour has caused significant reputational damage to VET, providing further incentive for students to choose higher education over VET where possible. Further expenditure declines are expected from next year as the National Partnership Agreement on Skills Reform comes to an end. This agreement was a commitment of A$1.75 billion from the Commonwealth to work with state and territory governments to drive VET reform between 2012 and 2017. The agreement expires in June 2017 and Commonwealth funding for VET is expected to fall by nearly $500 million. Key growth employment areas like aged care, early childhood education and hospitality rely on vocational training for skilled workers. More than 400,000 additional workers with vocational training will be needed by 2020. Building up qualified workers in the growing service and caring industries will be essential, particularly as employment in the manufacturing sector declines. The Foundation for Young Australians recently proposed the concept of job clusters as a way of thinking about jobs and preparing students with capabilities for a range of career opportunities. Vocational learning has a pivotal role to play in preparing people for jobs and alleviating skills shortages. The current system needs rethinking and refocusing to attract students and meet employer needs. Higher education has followed a very different path. Spending has grown by 45% over the ten years from 2005-15 and the strongest expenditure growth of 9% in one year occurred in 2014-15. It needs to be said that research accounts for some of this growth – for example $1.81 billion in 2016 is spent on direct research funding from government. Even so, it is clear that governments have prioritised university education over vocational training. Future job market projections suggest a need to restore balance in the tertiary sector. Already we see too many young people being prepared for jobs in fields with limited employment prospects – such as science and information technology. School expenditure increased 24% over ten years, some of which is accounted for in enrolment growth. At the same time, there has been minimal improvement at a system level. Australia’s international performance rankings have been in decline over the same period, suggesting that funds are not always being spent in the best places. The important thing is to direct money where it can have greatest impact. This could mean more funding for the schools most in need, for proven, effective programs and for developing great teachers. Supporting these areas can amplify educational gains. This is the first time preschool has been included in an overview of education expenditure. 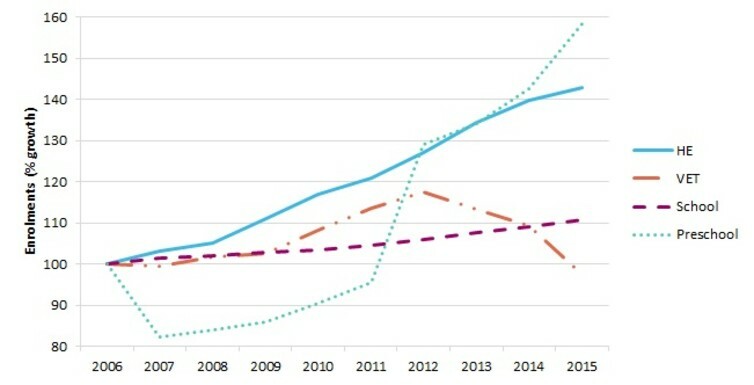 Unsurprisingly, preschool spending grew rapidly following the National Partnership Agreement on Universal Access to Early Childhood Education in 2009. While this agreement has seen Australia achieve near-universal preschool enrolment for four year olds, research shows one in three children do not attend for the number of hours needed to make a difference – and children in poorer communities have fewer high-quality services available to them. There is also evidence for Australia to adopt an additional year of preschool for three year olds to catch up with our OECD peers. The increase of more than 145,000 children since 2006 shows that the importance of attending preschool is being considered strongly by policymakers. Higher quality early years education would improve children’s learning outcomes through school and later in life.